Educators today must acquire and develop specific teaching skills in order to assure classroom success. Paper Masters shows you the importance of being a skilled teacher in this brief outline of the topic you see here. Every teacher must think about the skills required to be a teacher and often times, research papers are required on the topic for education majors. Paper Masters can custom write a research paper on teaching skills for you today. It has been said that teaching combines both art and science. As such, the individual instructor, despite the best teacher training, must acquire and develop specific teaching skills in order to assure classroom success. These skills go beyond the ability to write a lesson plan and can be incorporated into any teacher’s repertoire. The education of the youth of the nation is one of the most important tasks for ensuring a strong community and a strong nation. The learners and their parents are important elements in this endeavor, but the key element is the teacher in the assuring the quality of the educational system. Therefore the attitude of the teachers toward their work is an important component in the quality of the schools. Total absolute quality control is impossible, but each individual teacher sets the tone in his or her classroom. The quality of the educational system depends on the dedication of teachers to provide excellent programs for the students. Some teachers enter their classrooms thinking of teaching as an art, others enter thinking that they are performing a science, and still others believe that the profession is both an art and a science. A definitive answer to this question is elusive for the topic has been debated since the first classroom was constructed. However, a discussion of the topic offers insight to those who continue to teach. The first, and perhaps most important, effective teaching skill is to create an environment in which learning is encouraged, and students are comfortable in exploring knowledge. By being approachable yet professional, an instructor who is aware of and open to the diverse needs of all students can create an atmosphere that is learner-friendly. Second, how the teacher delivers the lesson plan is an important skill. A teacher should be excited about the material being taught, and varied in the types of classroom activities presented to students. Different students will have different learning styles, and a skilled teacher will incorporate multiple intelligences into units. A third vital teaching method of skill involves time management. A good instructor will utilize class time and available resources to cover the required material. If the teacher is unprepared, the students will not learn. The teacher must also be able to breakdown material into smaller chunks if necessary, scaffold learning, and be aware of an appropriate level of homework. The teacher must be certified and have professional knowledge and skill, but the personality of the teacher interacting with the students is an important component in producing strategies that will reach the individual students in the classroom. Each teacher must use a wide range of skills, knowledge and an understanding of the individual students to achieve optimum results. Teachers can attest to the fact that their jobs are unpredictable whether their students are students in high school or elementary school. Career Development Programs in Elementary School research papers look at how these programs influence a child's educational and socioemotional growth. Learning Style Inventory Elementary research papers look at how to determine a student's learning style. Core Teaching Strategies - In the modern field of education, there are several core teaching strategies that instructors use his or her class curriculum. 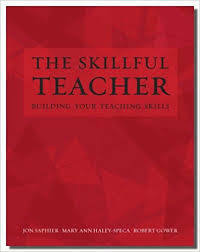 Paper Masters writes custom research papers on Teaching Skills and discuss three vital teaching skills teachers use to assure success in the classroom.